John Joe McGirl one of Leitrim’s famous republicans was born on the 25th March1921 in Drumany, Aughnasheelin, County Leitrim, John Joe was the second youngest of five children and along with his siblings attended Drumbibe National School. He continued his education in the Vocational School, Keshcarrigan. John Joe’s mother Bridget Mc Girl came from the townland of Aughacullion and was an active Cumann na mBan member during the War of Independence and later received a medal for her activities during that period. John Joe grew up in what were still turbulent times after the Civil War when political allegiances and beliefs were much more of a life and death issue than today. John Joe became involved with the Irish Republican Army in the 1930s. In 1939 he was arrest as part of a general precautionary round up of members of the Irish Republican Army on the eve of the Second World War and was imprisoned in Mountjoy Prison. It would not be the last time that he would be imprisoned in Mountjoy. In 1946, he was arrested along with eleven others and was sentenced to twelve months in prison for Irish Republican Army membership. In January 1957, John Joe was tried and convicted at Ballinamore courthouse and imprisoned in Mountjoy Prison. In 1974 he was arrested by British security forces as he prepared to give an Easter Sunday graveside oration in Belfast. He was then interned without trial for eight months at Lough Kesh and was there when the camp was burned, John Joe was released in the lead-up to Christmas 1974 and was greeted by bonfires as he arrived home. 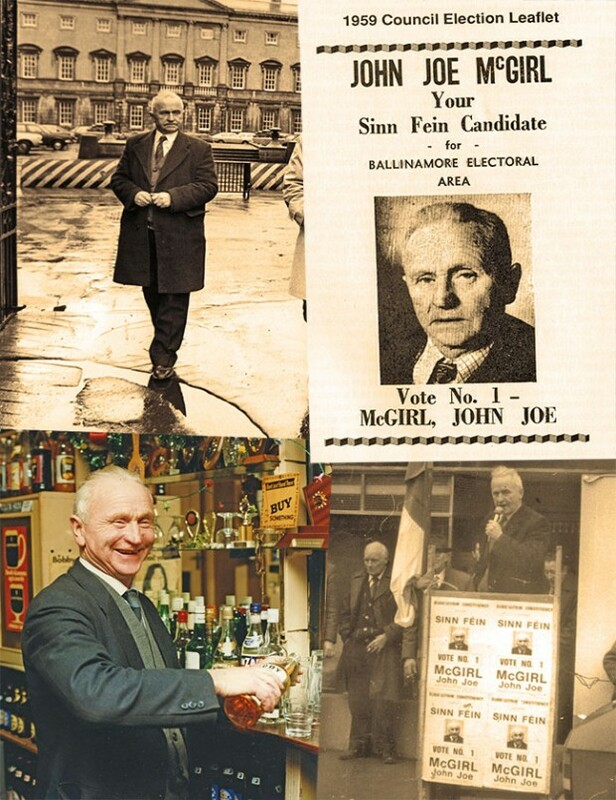 John Joe McGirl was a key figure in the rebuilding of the republican struggle in the 1969. Although a prisoner, he was elected as a Sinn Fein TD (Teachta Dala) for the Sligo - Leitrim constituency in the 1957 general election, topping the poll with 7,007 votes (15.7%).John Joe did not retain his seat in the 1961 general election. His share of the vote was halved and he received only 2,487 votes (7.3%). He was elected as a member of Leitrim County Council in 1960 and serving the people of Leitrim as a councillor when he died on the 8th December 1988. 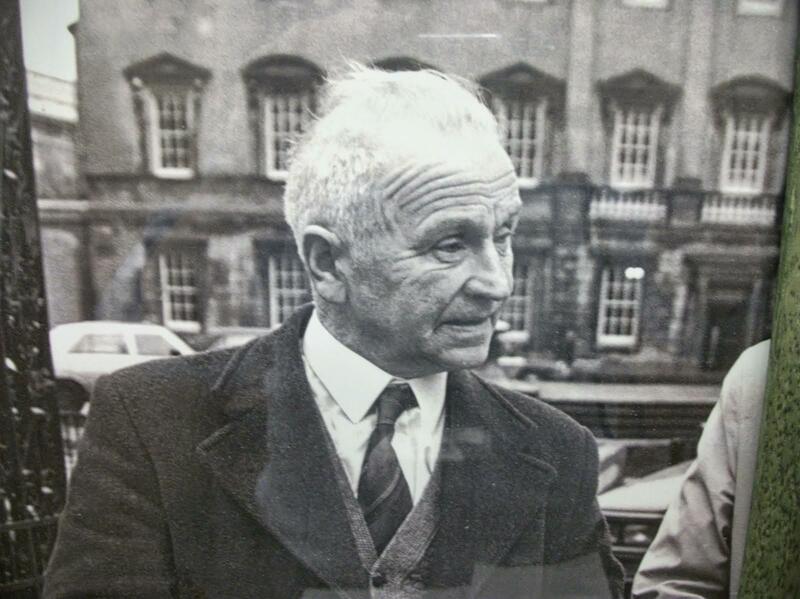 John Joe’s son Liam McGirl was co-opted to Leitrim County Council in 1988 after his father's death. John Joe McGirl always worked hard for the people of Leitrim and his door was always open to everyone. 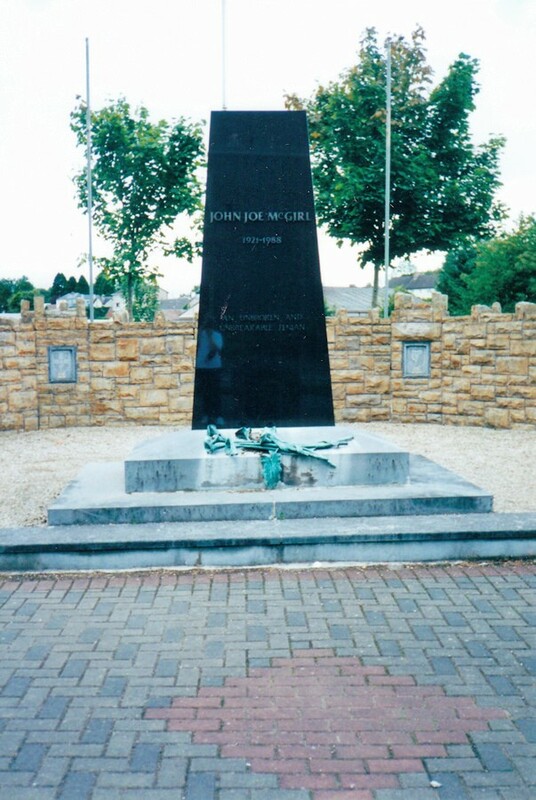 The John Joe McGirl Memorial stands beside the bridge crossing the Shannon-Erne waterway on the entrance to Ballinamore. Every year in the month of August the annual commemoration to John Joe McGirl takes place in the town where Republicans from Leitrim and other rural border areas assemble at the square at the top of the town to participate in the parade walking from the square through the town to the John Joe McGirl Memorial. The late Martin McGuinness regarded John Joe McGirl as “an inspirational leader”.